With rapid developments and improvements in smart technology today, home automation systems have become increasingly popular. They are only set to continue on that trend as smart technology advances with time. You can find some exciting predictions in 2019 from articles like DATAx’s. As a result, security systems have become more robust and have been improved in various ways. Many home automation systems and technologies make use of accompanying apps that can be downloaded and controlled on smart devices such as your smartphone or tablet. Many automated technologies such as smart doorbells, locks, lights etc. can be controlled and monitored all from a single centralised device like your smartphone, allowing you to manage and monitor various aspects of your home from a single location. This gives you more control over the various aspects of your home as well as provides you with more insight regarding the security and safety of your home. By having centralised control over the various automated systems within your home, you are given a more complete picture of your home’s overall security enabling you to respond to potential threats more quickly and easily than ever before. One of the major benefits of smart technology and home automation is the ability to remotely control and monitor your home. Using accompanying apps and other software, you can control and monitor various systems within your home even when you are away. This means you are able to keep constant watch over various aspects of your home even when you are not there. Additionally, many of these automated systems can be set to send you live notifications whenever they are activated or triggered, allowing you to constantly be kept up to date regarding your home’s security and safety. This allows you to easily respond to any unusual activities or potential threats regardless of your location. Many automated lights, doors, and cameras can be set to send you notifications whenever they are used allowing you to monitor any activity within or around your home. Being able to remotely control and monitor these automated systems from your smart device provides you with additional control and security as you no longer need to be physically present to access and interact with the various systems within your home. Many security services and companies require you to pay monthly subscriptions in exchange for their services. Additionally, many traditional security systems such as non-automated lights or security cameras can be less efficient and therefore more expensive to operate and maintain. With automated home technology such as motion activated lights or security cameras that maximise efficiency, these ongoing costs can be reduced and non-essential usage cut out completely. Additionally, some home automated security systems are able to automatically notify emergency services when they detect a potential threat allowing you to rely less on costly security services. Therefore, once installed, certain automated home security systems can often save you many with reduced security expenses and lowered energy costs. Many home automation technologies can be integrated with each to help create intricate systems that support one another. 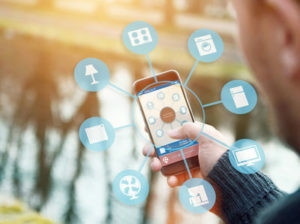 Interconnected automated systems within your home can help greatly improve your home security system as devices and technologies that are integrated can allow for more complex and co-operative security systems. For example, automated devices such as smart doorbells and security cameras can be integrated to work together. They can be set up to activate when a visitor approaches your door to notify you via your smartphone and give you access to video footage of the security camera on the phone screen. Additionally, alarm systems and automated doors can be integrated to lock down certain areas of your home when the alarm is triggered. Home automation technology can improve your home’s security by allowing you to allocate more control to the various systems in your home. This means you do not need to physically manage the various systems as much. For example, doors that automatically open, close, and lock can improve your home security as you waste less time fumbling for keys and manually unlocking them. Additionally, automated systems such as smart alarms can activate and deactivate automatically, lowering the risk of your home being left vulnerable due to you forgetting to activate your alarm. Therefore, automated home systems that are self-reliant can improve your home security by mitigating the possibility of human error. Automated systems within your home can greatly enhance your security systems through their integration capabilities, as well as through the centralised control and accessibility options that they provide. By automating the various systems within your home, you can lower your ongoing security and energy costs. Additionally, home automated systems allow you to remain constantly connected to your home’s security systems providing you with more control and insight over your safety and security.